Crisis Response International, or CRI, is a nonprofit organization located in Wilmington, NC. We train and deploy volunteers from communities, churches and other independent organizations for the purpose of responding to disasters and compassion initiatives around the world. We deliver resources to areas that would otherwise be off-limits to volunteers. Our specialized training avoids what the government calls, “the second disaster” which refers to the chaos that often ensues when unplanned resources arrive on the scene. Hurricane Florence made landfall in the Carolina’s during September 2018 causing flooding and power outages. Florence dropped a maximum total of 35.93 inches of rain, becoming the most intense tropical cyclone recorded in the Carolina’s. On September 19, after the rain had stopped, a majority of evacuees were urged by officials to stay away from their homes due to the potential threat of floods. Many roads remained closed, and thousands lacked power in their homes for days after the storm. We were on the ground finding a strategy to prepare for the damage that was anticipated from Florence, and encouraging residents to use all safety methods. Since the storm, we have been distributing personal care, hygiene and clean-up supplies to our impacted neighbors. 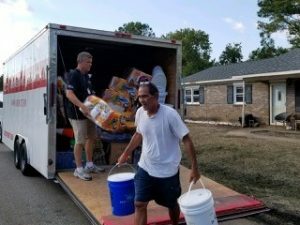 Thanks to Good360 and their corporate partners like Domtar, Scotch, Edmar, Boll & Branch, Tyvek and Emerson we were able to provide countless donations to those in need.